As The Good Lie debuts in theaters, South Sudan stands on the brink of the worst man-made famine the world has seen in over a decade. The film tells the story of Sudan’s lost boys and girls who fled their homes in search of food, safety, medical care, and their families in refugee camps in neighboring countries. A peace deal signed between the Sudanese government and the southern rebel movement, the Sudan People’s Liberation Movement/Army (SPLM/A), in 2005, paved the way for southern independence in 2011. Three years later, in December of last year, South Sudan returned to civil war as political leaders fought over control of the government and the country’s vast natural resource wealth. South Sudan was already vulnerable to food insecurity after nearly four decades of civil war, given limited infrastructure and lack of basic services. There is only one paved road outside of the capital city Juba and 83 percent of the country is dependent on agriculture. Over 100,000 civilians have sought protection from the United Nations on peacekeeping bases around the country. In Bentiu, the capital city of war-torn Unity state in South Sudan, over 47,000 people have taken refuge on the UN base there alone. Families live knee deep in dirty water and sleep standing up, holding their children in their arms. In June, the medical organization Doctors Without Borders, which has its largest aid operation in South Sudan, estimated that three children under five die every day in Bentiu. Horrific conditions in the camps have forced others to walk hundreds of miles to safety. Over 460,000 have fled to neighboring countries, including 250,000 who have crossed the border into Ethiopia, at a rate of 1,000 people daily. Regional concerns over the humanitarian crisis have been highlighted by the East African mediation team leading the peace process, but so far they have proven unwilling to take action on promised consequences against those who continue to undermine the peace process and obstruct humanitarian aid from reaching those in need. For its part, the Government of South Sudan has failed to discipline their own troops that have looted and halted aid convoys, and even attacked a food distribution site. The Parliament recently forced through a draconian security bill that gives the security forces sweeping authority over civilians. Worse yet, the conflict looks set to intensify as government and opposition forces prepare for the dry season, when troops movements become easier and fighting has historically intensified. The only way to solve the humanitarian crisis is to stop the fighting by creating consequences for South Sudan’s warring elites through sanctions, travel bans, and other punitive measures. Without concerted action from the region and the international community to change the cost of war, civilians will continue to pay the highest price. Editor's note: former Enough Project intern Irina Balytsky contributed to this post. 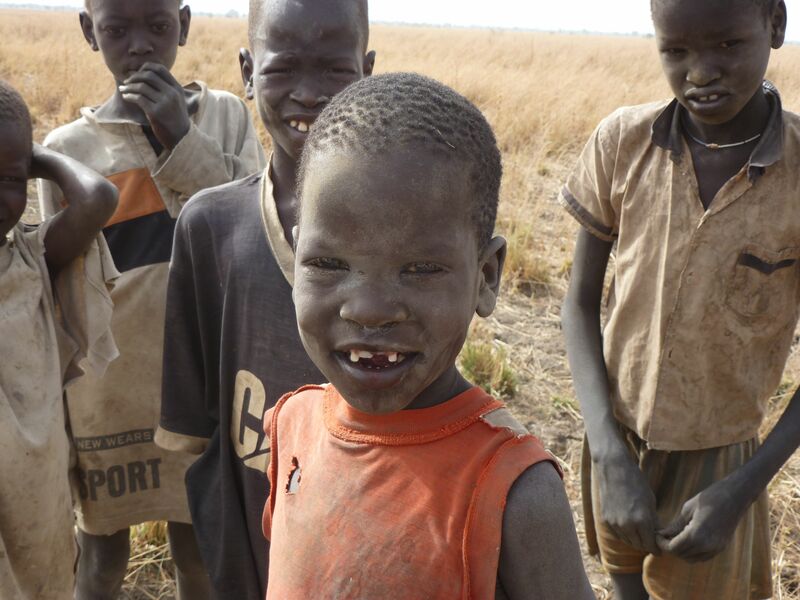 Photo credit: Children in Mayom, Unity State, South Sudan, Justine Fleischner, March 2013.